The Samsung Galaxy S7 Edge running on Android 9 Pie OS has appeared on Geekbench. This indicates that the Pie update could be under internal testing for Samsung’s 2016 flagship smartphone. The Galaxy S7 Edge users may see it as ray a hope for the arrival of Android 9 Pie update. However, there is a certain reason why the S7 Edge owners will not be receiving the update. 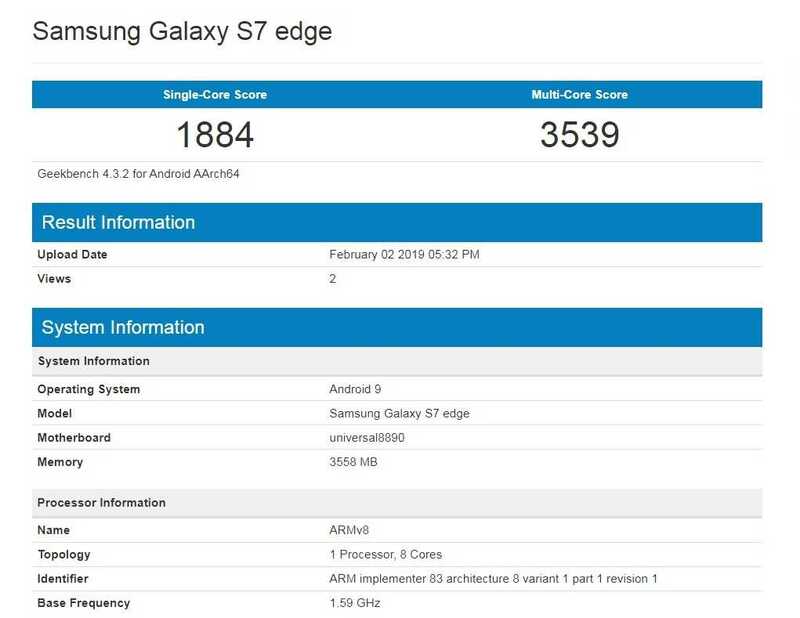 The Geekbench screenshot shows the Exynos 8890 processor and 4 GB RAM powered Galaxy S7 Edge running on Android 9 Pie OS. Except for the Pixel series of smartphones from Google that are promised three years of Android software updates, smartphones from brands can receive only two major Android upgrades. So, what about the Galaxy S7 Edge smartphone? Will it be receiving Android 9 Pie OS update? Samsung had launched the Galaxy S7 Edge in February 2016 with Android 6.0 Marshmallow OS. By mid-2017, it was provided with Android Nougat update. By mid-2018, the Android Oreo was released for it as the second major Android update for the smartphone. Since the smartphone has been already blessed with second major software update, it is unlikely to receive the Android 9 Pie update. In December 2018, Samsung had confirmed the list of Android 9 Pie eligible devices along with release roadmap through the Samsung Members app. There was no mentioning on the Galaxy S7 and Galaxy S7 Edge in the list which is like official confirmation that these devices will not be treated with Android 9 Pie update. The S7 Edge featured a 5.5-inch S-AMOLED display and it was released in Exynos 8890 and Snapdragon 820 chipset variants in different markets. The other specs of the phone include 4 GB RAM, up to 128 GB storage, 12-megapixel rear camera, 5-megapixel selfie camera and 3,600 mAh battery. If you still want your Galaxy S7 Edge (or Galaxy S7) to run Android Pie, then you may have to resort to using Pie-based custom ROMs. The above listing could well be an instance of someone benchmarking the device on Lineage OS 16. We’ll get to know in the next few weeks if there’s any official confirmation from Samsung about Android Pie update for S7, S7 edge and a few other old devices. We’ll make sure to keep you posted.